Caste is a persistent driver of inequality in India, but little is known about the economic inequality between the jatis. Most of the academic literature on caste and inequality in India is based on surveys that use caste categories that are used by the government of India, such as Scheduled Caste (SC) and Scheduled Tribe (ST). 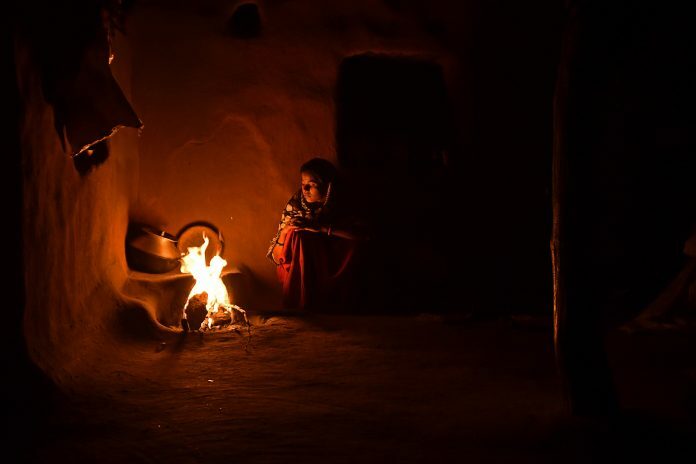 But in everyday life, caste identity is experienced and practiced as jati — hereditarily formed endogamous groups whose identities are manifested in a variety of ways: occupational status, property ownership, diet, gender norms, social practices, and religious practices emphasising purity and pollution. Each region of India has several hundred jatis. But there is no pan-Indian system of ranking them, and the local rankings of jatis routinely change. Placement of jatis in broad government ‘caste’ categories is complicated, and affected by politics and the level of mobilisation achieved by the group. Data collected in 2011 from poor rural districts in Bihar reveals that even within the generally disadvantaged Scheduled Castes and Scheduled Tribes, some jatis are significantly worse off than others. The India Human Development Survey (2014) found that inequality between government-defined caste groups contributes to 11 per cent of total inequality in monthly consumption expenditure. But it is the jati-level information — about between-jati inequality — which may hold the key to a deeper understanding of the determinants of inequality in India. This could have significant implications for the design and impact of poverty-alleviation programs. 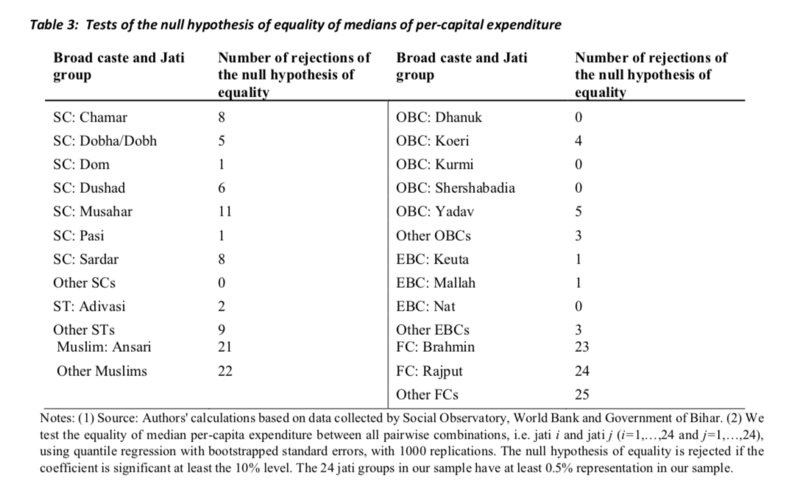 If some jatis can capture more benefits than others, jati can become an important source of ‘exclusion error’ in the implementation of these programs. 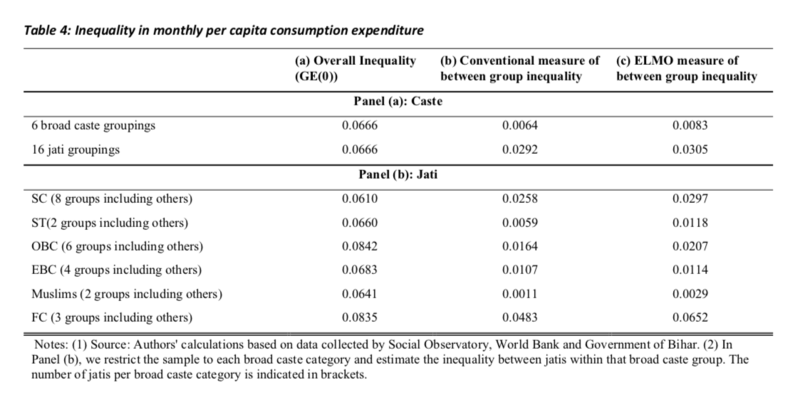 We found that decompositions using government caste categories (a practice of breaking up data into constituent elements) show that the contribution of between broad-caste inequality to total inequality stands at less than 1 per cent. But decompositions using between-jati inequality are, however, nearly three times higher. The Musahars, for example, appear to be considerably disadvantaged even relative to other SC counterparts. They are almost entirely landless (average 0.07 acres of land versus the SC average of 0.17 acres of land); have low levels of education (23 per cent of household heads have completed schooling versus the SC average of 36 per cent) and their monthly per-capita expenditure is also approximately 10 per cent lower. This is consistent with anthropological studies that have noted that this jati, geographically concentrated in Bihar and eastern Uttar Pradesh, is one of the most politically, economically and socially marginalised groups in India and quite distinct from the other SC jatis. Similarly, among the OBCs, Dhanuks and Kurmis appear significantly disadvantaged relative to Yadavs on landholding (but not on other indicators). They own an average of just 1.23 and 1.18 acres of land, respectively, while the Yadavs own an average of 2.27 acres. Our analysis also included the exercise to de-compose inequality into between-group and within group components. These estimates suggest that in the poorest communities of rural Bihar, inequality appears to emerge from variations within caste and jati groups, rather than between them, which is consistent with other literature on the subject. The results raise the question of whether aggregate caste groupings are an effective strategy for targeting poverty-alleviation programs, and whether benefits disproportionately accrue to specific jatis within these caste groupings. To study the role of caste in accessing large poverty alleviation programs, we examined the Mahatma Gandhi National Rural Employment Guarantee Scheme (MGNREGS) and the Bihar State Rural Livelihoods Program (BSRLP). The two programs use two very different approaches to reach the poor. The BSRLP requires project implementers to identify possible beneficiaries and offer the program services to them. This approach, which we call “programmatic targeting”, assumes that it is up to the policy maker to induce participation among the population of beneficiaries. The MGNREGS, on the other hand, is a “self-targeting” programme. It assumes that vulnerable individuals who lack better options will choose to participate on their own. We found that some jatis, even within targeted SC and ST groups, participate more than others. The key finding here was that even though the programme was offered to entire groups, the actual take-up shows considerable variation by jati. There are many possible drivers of this outcome. Geographic clustering, unequal demand for the programme due to occupational patterns or variations in the status of women, the bias of programme implementation teams, etc. can all make a difference to participation rates. When we use broad caste categories, we see the expected pattern of lower participation in non-SC/ST groups. However, when we treat these groups as the omitted category and examine participation within the SC/ST group, we see considerable heterogeneity. We see that Musahars show the strongest participation, followed by Chamars and Dushads, when compared to non-SC/ST jatis. They are four times more likely to possess a job-card than Dobha households and almost twice as likely to possess a job-card as Sardar households. We observed heterogeneity in take-up among OBCs who are less likely to participate in MGNREGS, presumably because of their higher socio-economic status. Shershabedias are significantly less likely to participate even in comparison to other OBC jatis. The contrast between programmatic targeting and self-targeting is also interesting. The two leading sets of beneficiaries are quite different, suggesting that self-targeting has different effects by jati than programmatic targeting. Moreover, inequality within jatis seems to matter less for self-targeting than programmatic targeting. The recently released Economic Survey of India for example, highlights the existence of 950 poverty alleviation programmes at the national level, and hundreds more at the state level. The report acknowledges targeting inefficiencies in the form ‘exclusion error’ and argues that ‘leakages’ are largely due to the presence of loopholes, the lack of transparency and failures of accountability. Our results suggest that the programme benefits may be affected by social identity. Our study examined the relationship between caste and inequality in Bihar. We found that after controlling for a variety of socio-economic variables, there remains a lot of variation at the jati level. For example, Doms and Adivasis are less likely to participate in the livelihoods programme, while Dobhas and Sardars are less likely to have an MGNREGS card. This is an edited extract from the policy research working paper of The World Bank titled “Jati Inequality in Rural Bihar” published in July 2018. You can read the full report here.